Watch full One Piece Season 15 Episode 35 English Dubbed full HD online. One Piece Episode 551 English Dubbed online for free in HD. Neptune’s army launches an offensive strike against Hordy, but they are completely wiped out and Hordy goes to Conchcorde Plaza. Meanwhile, at the Fishman District, Vander Decken is despondent at Sihrahoshi’s rejection and decides to kill her. Hordy is confronted by the army, but Ikaros uses a Sea Bear to attack. 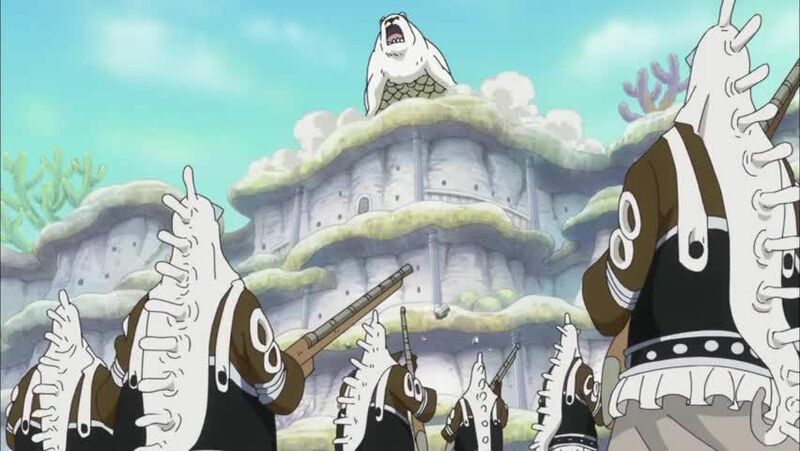 Meanwhile, Shirahoshi, Jimbei and Megalo leave the Sea Forest to confront Hordy. Fukaboshi, Manboshi, Ryuboshi arrive at the plaza to save their father. Upon their arrival, Fukaboshi lectures Hordy for trying to ignore the island’s history of discrimination. Hordy, however, has his beasts attack the princes and gives Energy Steroids to his crew. The princes are easily defeated and Hordy laughs as Neptune watches in horror.